Chicken should be defrosted and cleaned before starting. Brown the Pine Nuts in a 6 quart pot on medium high heat. Keep stirring to prevent burning. Empty the pine Nuts into a bowl as soon as they are lightly browned. Brown the 1# meat in the same pot. 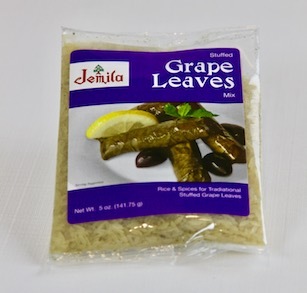 Add the package of Jemila Grape Leaf Stuffing Mix and 1 cup water while there is a little pink still visible in the meat and cook till the water is absorbed by the rice. Remove from heat and add the pine nuts. Fill the Chicken’s main cavity with stuffing while the stuffing is still hot but not so hot it will burn you; also fill between the breast and skin from the leg side of the Chicken. Fill well but do not pack the filling tightly as it will expand while cooking. Fill the neck cavity. Pour the other cup of water into the cavities and sew or pin to close. Place the stuffed chicken on a rack in the roaster pan. Cover and bake in a preheated oven at 375 degrees for 20 minutes. Reduce to 350 degrees for 20 minutes. Reduce again to 300 degrees for 20 minutes. Remove the lid of the roaster and let bake 20 additional minutes to brown and internal temperature reaches 180 degrees. Beer, wine or Kitchen Basics Soup Stock may replace the cup of water added to the chicken before roasting.